Use the Quarter Inch Corner Marker to accurately mark a quarter inch from the corner. 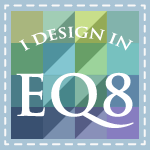 This quilting tool is small in size and easy to carry around. As a result you can use it to measure while hand piecing small patches and tricky intersections. 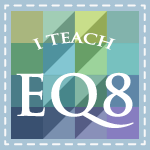 It works equally well on bigger quilts and pieces where a high level of accuracy is of importance. I use it in blocks like the Eight pointed star , Le Moyne Star and Tumbling blocks. It is indispensable in patchwork that requires inset- or Y seams. The carefully calibrated corners measure accurately. 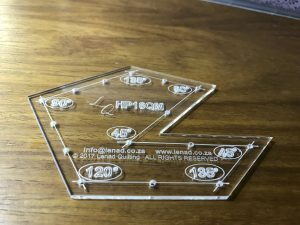 Therefore you can mark inner 30 and 45 deg corners and outer 90, 120 and 135 degree corners as a result. This marker is also indispensable to make perfect mitered borders. A 0.5 mm clutch pencil, graphite or chalk, perfectly fits into the marking holes. As a result, the mark is precise and therefore gives you the perfect stitching line. No more eyeballing the seam allowance. Cut the patches you want to join precisely. Make a mark on the fabric by inserting the pencil tip through the corner hole. Keep the pencil perpendicular to the surface that you mark. Line up the two patches by inserting a pin through both corners. You will find no stretches or buckles. Thank you for the QICM. It saved so much time on the Le Moyne Star and it is accurate every time. I finished my project in record time. I’ll definitely recommend this in the classes I teach. Buy it here or contact me to bring one to the next Jacaranda Quilters’ Guild meeting. 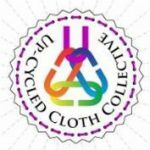 A couple of years ago, I joined a Facebook Group called Up-cycled Cloth Collective. This site was started by Melanie Brummer and now has a following of nearly 40k members. I have seen what a difference 40k people can make to upcycling or recycling of textiles worldwide. It has definitely changed my point of view. Descending from a very thrifty mother that grew up during the depression years of the 1930s and the war years thereafter, we were brought up not to waste. This has now, in my latter years, rippled out in almost all spheres of my life. 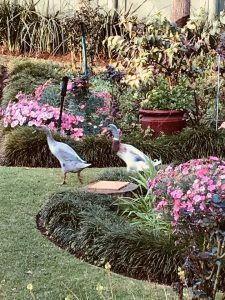 We run a productive worm farm at the guest house for scraps and paper, we keep runner ducks for pest control, eggs and fertilizer and I recycle fabric. Not much of a fashion freak, I buy durable clothes and wear it until it is not decent or reparable anymore. This is where the problem comes in, as I’m not able to dispose of these clothes. I have never, and probably never will throw a piece of clothing in the bin. I am too ashamed of the state of clothing to take it to a gift shop as no-one deserves to get it. I therefore keep it. The beginning of 2017 marked a turning point. I identified a couple of projects to work away the bulk of the clothing. The first of the projects I decided on is a strip quilt from hubby’s old shirts. 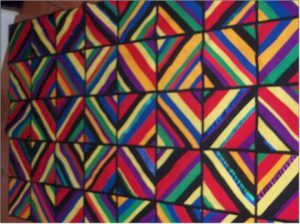 Imigqa Yomlingo + The Zulu translation for “Magic stripes” Strip quilt made for my son Kenny. Every shirt is de-buttoned and cut into usable pieces. From the larger pieces I cut 7 ½” squares to use as base of the blocks. What is left, I cut into 1 ½” strips to mix into my (generous amount of) fabric off-cuts. I use 1 or 2 layers of old t-shirts as batting and quilt as you go the strips into position, starting in the center of the block. The block gets squared off to 7”. All the off-cuts go into the dog bed bag. Eighteen months down the line, I haven’t made much of a dent in the scrap bin fabric – as a matter of fact the scraps seem to have accumulated, but the tower of squares grows each day as I sew a block or two to get my eye in for serious sewing. I’ll join the blocks with the quilt-as-you-go method once they are all done. This strip quilt will probably end up as a picnic quilt and get smeared by little dirty hands and muddy paw prints, but I can already see it becoming part of our busy family. It warms my heart to know that every piece of fabric and those within, are re-loved in their second life. I have inherited a lot of fabric. From my Mom, from my Sister and some from my friends. I also was in the bad habit to buy fabric that I liked, with no specific project in mind. All these factors lead to an accumulated fabric stash of unneeded cloth. At the beginning of 2018, I decided to downscale this stash and have been actively busy with it since. I have found some fabric in this stash of dubious origin and/or dubious fiber. As I have not been able to trash these fabrics, I have been on the look out in which projects I can use them. This brings me to today’s tutorial of Japanese folded hexagons. This pattern can be hand stitched or made with a machine. Personally I prefer the hand stitched version as this is something that I can drag with me wherever I go and have to wait. The flowers come together surprisingly fast. But I have to warn you, it is pretty addictive. 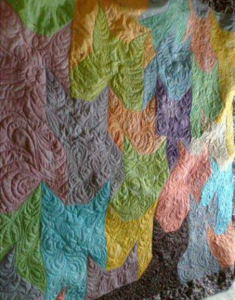 This pattern is quilt as you go, so once it is finished, it is indeed finished. No need to quilt. The pattern is very forgiving to the fabric that is used. I mainly stay with cotton on the bigger fabric that folds over the core, but for core fabrics, anything goes. Polyester, wool, silk, thicker and thinner all works well. Even the batting / wadding used on the inside, can be flannel, t-shirt fabric, other knits or pieces of wool, bamboo or polyester batting. Try this pattern and send me a picture!